My research with agoutis has focused on their predation and dispersal of seeds. 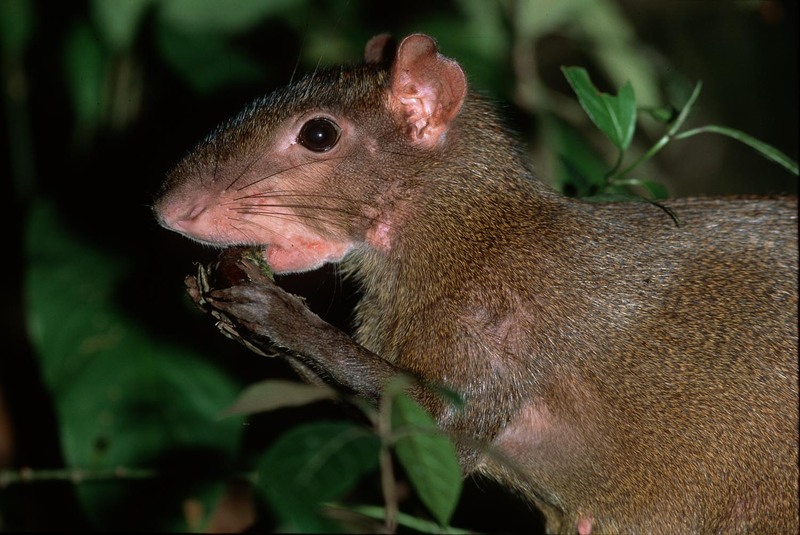 Agoutis prefer large seeds which they can store in scattered underground caches. They later retrieve and eat these caches when there is no fresh food available. This behavior, known as scatter-hoarding, is very important to the trees because it moves the seeds away from the mother tree and plants them into the soil where they can sprout and grow into seedlings. Seeds that remain in the open are generally killed by insects or other seed eating mammals. However, agoutis also have good memories and are able to retrieve and eat most of the seeds they bury. Agoutis are thus sometimes harmful and sometimes beneficial to trees. This is known as a conditional mutualism and our central question is to determine what conditions affect this relationship. This question is important for understanding forest regeneration, as well as the mutualistic relationships that promote the evolution of diversity. 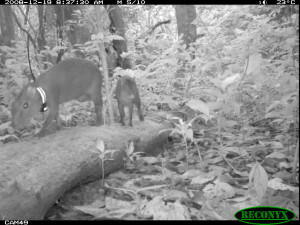 We used a combination of cutting edge techniques to study this system including radio-tagged seeds, Automated Radio Telemetry, and arrays of camera traps. We found amazingly high levels of cache thievery by agoutis, resulting in some seeds being moved dozens of times by different animals, moving much further than you would expect if just one animal had been involved. Furthermore, this repeated movement is directional, moving the seed into areas of lower density trees (of that same species), where it is less likely to be discovered by thieving rodents, but also where it faces less competition. We had a great team of collaborators and students addressing these questions, at the fantastic Barro Colorado Island field site in Panama, run by the Smithsonian Tropical Research Institute. Please see our project blog, The Agouti Enterprise, for more about this project.